Mark your calendars on August 31st for Denver’s first ever dispensary fun run! 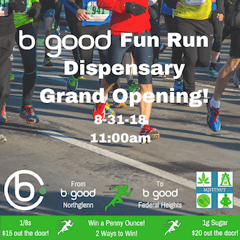 The Bgood dispensary family is kicking off their Grand Opening Days Event to celebrate the opening of their newest location in Federal Heights with The Bgood Fun Run, presented by MJFITNUT! It’s going to be a weekend filled with incredible deals on some of Colorado’s best cannabis products, giveaways, and special guest appearances! 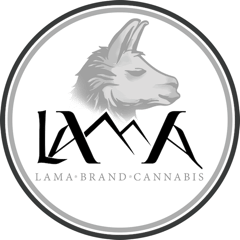 You can also enter to win an ounce of Lama Brand Cannabis for just a penny, with two ways to enter! Get your tickets for the fun run while you still can! The Bgood Fun Run, presented by MJFITNUT, will start at the Bgood Northglenn location at 11:00 am, and consists of a five mile fun run to their newest location in Federal Heights. There will be a complimentary shuttle making loops between both locations, so after the run, you can catch a ride back to your car and recover on the way there! This is a fun run and everyone who participates will receive a free Bgood t-shirt, but the first person to finish the run will win a penny ounce of Lama Brand Cannabis! 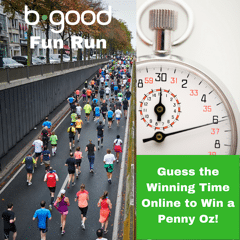 You can also enter to win a penny ounce in the online contest, simply by guessing the finishing time of the first person to cross the finish line! Check out the contest here for more details and to enter for your chance to win! In business since 2009, Bgood has nurtured strong relationships within the community. They give back to the environment, their neighbors, and their employees. They use both traditional and hydroponic practices to grow their cannabis, and have been practicing Integrated Pest Management (IPM) since 2012. IPM is the practiced horticultural technique of using natural biology to prevent the spread of negative pests or detrimental factors impacting our flower. Their teams use up to eleven different beneficial bugs like ladybugs, and natural ecosystem agents to protect their plants. The different growing practices found within their company have evolved into art forms, producing cannabis you can feel good about. They began testing their strains long before it was a requirement of the state to ensure they were delivering healthy cannabis. Their traditional grow is managed by Master Grower, Denny Dikeman, who in five years has never lost a crop. Their hydroponic grow is managed by the Lama Brand Cannabis team, who grow their award-winning cannabis exclusively for Bgood. Bgood will have $15 eighths of their amazing cannabis flower and $20 grams of live sugar out the door. 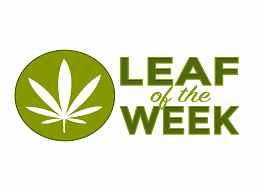 You can visit Leafbuyer for a full list of their grand opening days deals and specials. If that isn’t dope enough, you can also witness local Colorado artist, Mpek, painting a live mural at the new Federal Heights location! While you’re there, don’t miss the chance chance to meet the man behind strains such as Star Dawg & Chem Dawg in person!! That’s right! Bgood has invited legendary breeder and “High Times Hall of Famer” Top Dawg from Top Dawg Seeds! My husband Antonio and I will be participating in the fun run on Friday, starting at 11:00am in Northglenn. We are both certified personal trainers and competitive trail runners specializing in cannabis fitness and nutrition. We will be on site at the Federal Heights location after the run answering any questions about utilizing the benefits of cannabis to accomplish your own health and fitness goals. Get your tickets now and I’ll see you there!